A memorandum of understanding (MOU) on judicial exchanges and cooperation was signed between the Supreme People's Court (SPC) of China and the Supreme Court of Justice of the Republic of Panama on Jan 24. 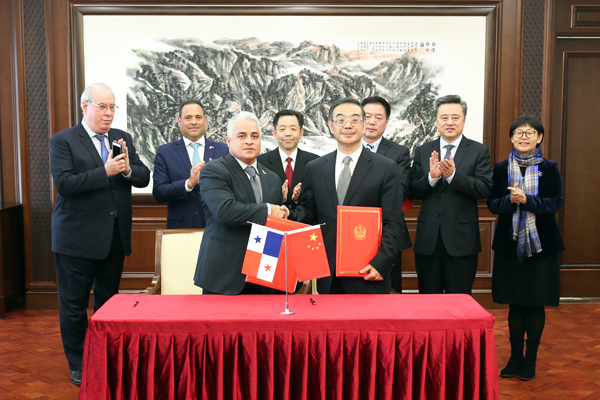 Zhou Qiang, president of the SPC, welcomed the Panama judicial delegation led by Hernán De León Batista, president of the Supreme Court of Justice of the Republic of Panama, at the signing ceremony. At the ceremony Zhou said that more and more cooperation in various aspects has developed between China and Panama since the two countries established diplomatic relations. China and Panama have had sound judicial exchanges for years. Zhou said he believed that the meeting will promote the two countries' judicial relationship. He briefed the meeting on the rule by law in China and some of the courts' judicial and enforcement work. He pointed out that China highly values deepening judicial reform, improving enforcement work, establishing smart courts and constructing a modern judicial system, aiming to "letting the people feel justice in each judicial case". According to Zhou, courts at various levels in China have been carrying on judicial accountability, promoting trial-centered criminal proceedings, improving judicial assistance in human rights, advancing judicial transparency and increasing the adoption of advanced technologies such as big data and artificial intelligence in trials and enforcement, which has improved judicial efficiency and given the people a stronger sense of fulfillment. Both sides expressed their willingness to increase judicial exchanges and cooperation. Zhou suggested that cooperation in aspects of talents exchange, case study and professional trials should be promoted to deepen the two countries' relationship. Hernán De León Batista also showed his interests in cooperating with the SPC in judge training and maritime trials.